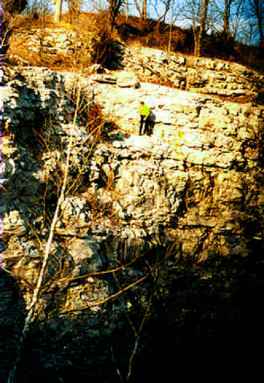 FIGURE 4.1 Determining the manner of death in falls from great heights may be difficult. See next photo. 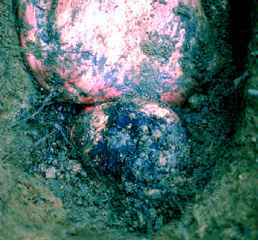 FIGURE 4.3 There were few visible external injuries to the body. Autopsy revealed significant head trauma. See next photo. 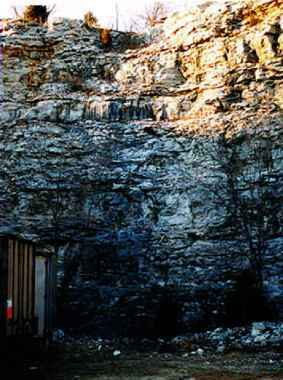 FIGURE 4.2 The body of a young man was discovered on the ground at the base of this cliff directly beneath the investigator wearing the yellow jacket. See next photo. 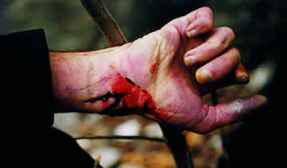 FIGURE 4.4 The manner of death was determined in part by the finding of an old scar and a recent incised wound on the decedent's right wrist. Investigation also revealed the decedent had been despondent. FIGURE 4.5 This man was working on a tower when he fell over 200' to his death. He had numerous injuries to his trunk and extremities. See next photo. FIGURE 4.7 This shows the extent of the force. The bone came through his boot. FIGURE 4.8 A man was found dead on the sidewalk with massive head trauma. See next photo. 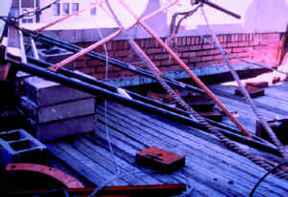 FIGURE 4.9 On top of the building above the decedent, a pulley device with counterweights had been knocked over by high winds. See next photo. 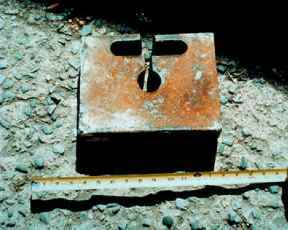 FIGURE 4.10 This is the metal counterweight which fell off the building and struck the man in the head. 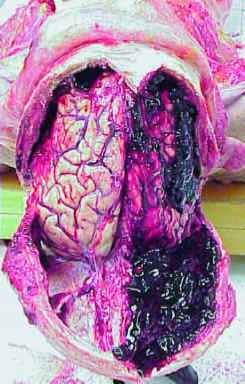 FIGURE 4.12 The brain after the skull has been removed. 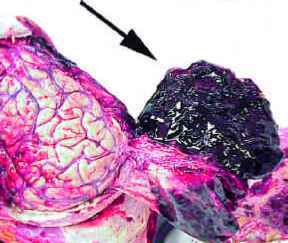 Both a subdural hemorrhage and contrecoup contusions were present. See next photo. 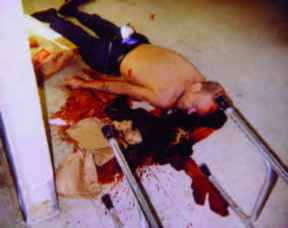 FIGURE 4.11 This man fell at his home. 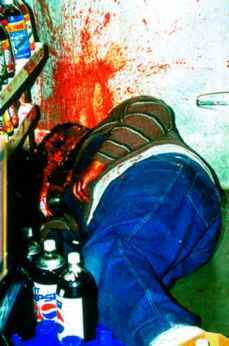 The impressive amount of blood at the scene proves his death was not sudden. See next photo. 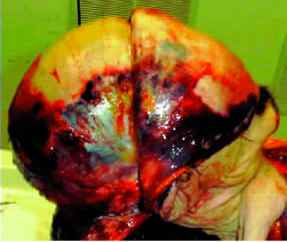 FIGURE 4.13 A closer view of the subdural hemorrhage. He also had a hypertensive bleed into his brainstem which caused him to fall and receive his other injuries. 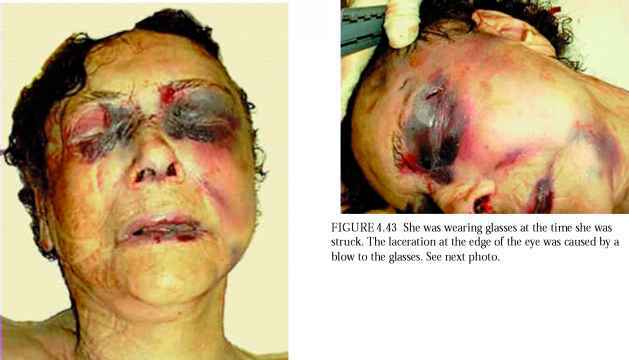 FIGURE 4.14 An elderly woman was sexually assaulted and killed by multiple blows to the head. See next photo. FIGURE 4.16 A pattern was discovered on the decendent's face. See next photo. FIGURE 4.17 The suspect was wearing a pair of these boots. See next photo. FIGURE 4.18 The sole of the boot. See next photo. 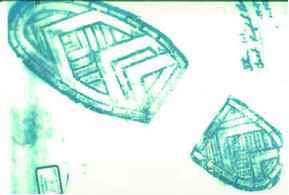 FIGURE 4.19 Fingerprint powder was placed over the sole and the pattern was copied onto a transparency. See next photo. FIGURE 4.21 An elderly woman was abducted and killed. She was buried for approximately ten days. See next photo. 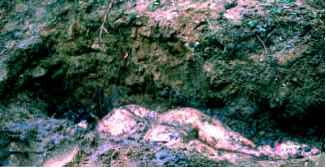 FIGURE 4.22 The body had not decomposed much at the time of its removal from the burial site. It was transferred to the morgue and placed in refrigeration. See next photo. FIGURE 4.20 The transparency was placed over the face and the comparison was thought to be a match. The examiner could not prove with certainty the suspect's boot caused the injury; however, he could say with certainty that a boot with a similar sole made the mark. 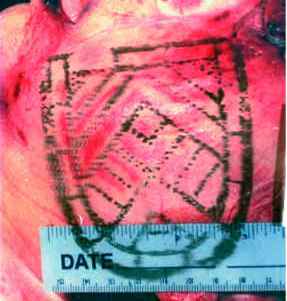 FIGURE 4.23 The autopsy was performed the next day. 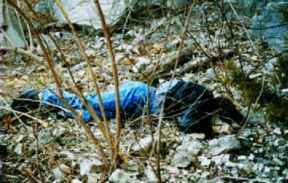 The body had significantly decomposed within the day after discovery. There were lacerations of the scalp and obvious fractures of the skull. See next photo. FIGURE 4.25 It was not until the skull was cleaned that the numerous semicircular patterns became evident. The woman had been struck numerous times with a hammer. 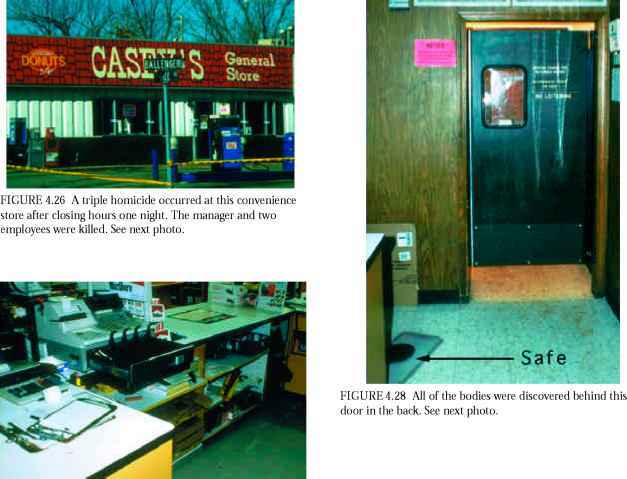 FIGURE 4.27 The cash register and safe had been opened. See next photo. FIGURE 4.29 The man was in the cooler. 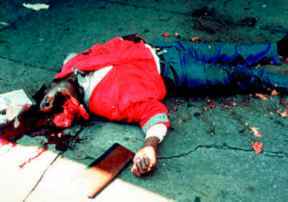 He had been struck in the head multiple times, although law enforcement thought he and the others had been shot with shotguns because of the tremendous damage and amount of blood. See next photo. 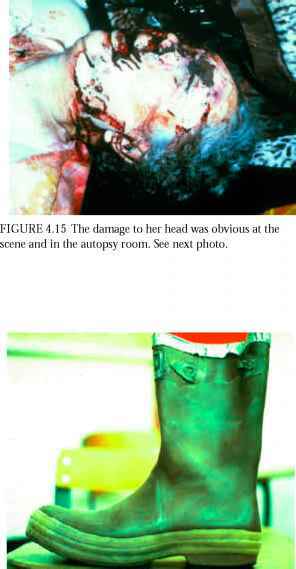 FIGURE 4.32 The fractures to the skull allowed an easier diagnosis to be made regarding the weapon. The depressed fracture was the typical circular pattern made by a hammer. See next photo. FIGURE 4.30 The two women were in the bathroom. Both had been killed in that location. See next photo. FIGURE 4.31 All three had been struck in the head with a hammer. The wounds were all on the left side as on this woman. See next photo. 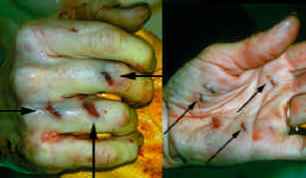 FIGURE 4.33 One of the women was stabbed in the hand with a screwdriver, in addition to being struck in the head. 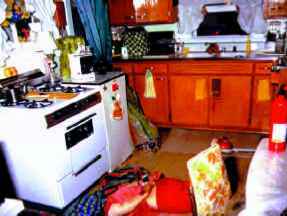 FIGURE 4.34 This elderly woman was discovered dead in her kitchen. There were no signs of struggle in any other room; however, the house had been ransacked. See next photo. FIGURE 4.36 The body on the autopsy table. See next photo. FIGURE 4.38 Her hands were tied with three different articles of clothing. See next photo. 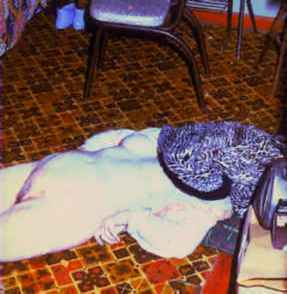 FIGURE 4.35 A closer view of the body on the kitchen floor as she was discovered. See next photo. FIGURE 4.37 There was a bedspread wrapped around her head under the bag. See next photo. FIGURE 4.39 Her hands were swollen due to the constriction of the wrists by the ligatures. See next photo. FIGURE 4.41 The injury to this elbow and one like it to the other elbow suggest the woman had her hands bound behind her when she was forced to the floor. See next photo. FIGURE 4.42 There were multiple blunt impacts to the face. See next photo. 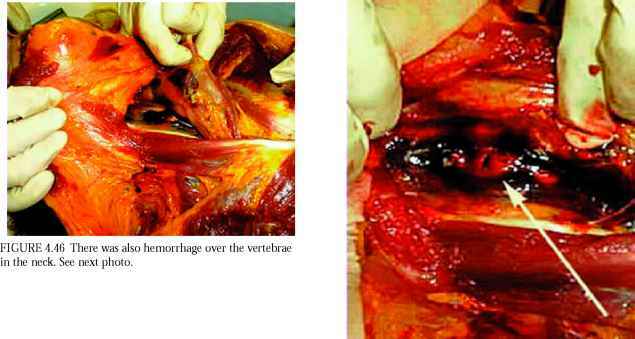 FIGURE 4.44 The degree of subscalpular hemorrhage illustrates the numerous impact injuries. She was not struck just a couple of times. See next photo. 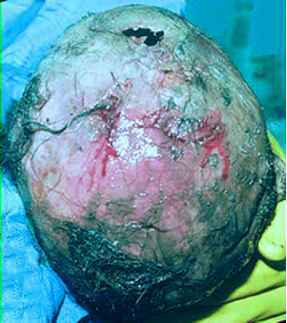 FIGURE 4.45 The subscalpular hemorrhages were more impressive on the right side. See next photo. 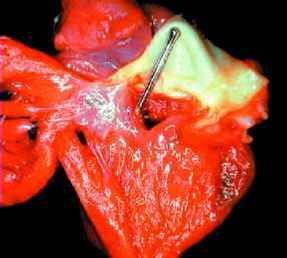 FIGURE 4.47 The hemorrhage was caused by a fracture of the neck (arrow). 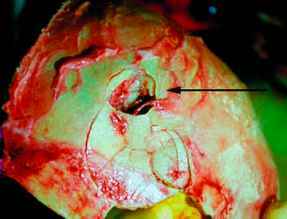 The fracture was caused by a violent hyperextension of the decedent's head.